On an Island shows the Drawing Week work of the following NAS students: Sasha Allen; Akira Alvarez-Sharkey; Tony Amarat; Antoinette Barbouttis; Karen Barbouttis Sam Beatty; Sandy Bliim; Michelle Belgiorno; Adam Bradford West; Jayne Britt; Georgia Brown; Olivia Burge; Mandy Burgess; Rachelle Burns; Leonie Burridge; Josh Calnan; Sophie Cape; Johan Carter; Melissa Chalker; Nic Collerson; Criena Court; Jesse Cunningham Reid; Emma Dacey; Holley Dolmer; Anastasia Drexler; Annamarie Dzendrowskys; Fiona Edmeades; Laura Ellenberger; Bronwyn Evans; Cobie Farrell; Harrie Fasher; Nell Fergeson; Tim Ferguson; Angus Fisher; Jasmin Fluhrer; Julia Fluhrer; Todd Fuller; Stephanie Gallagher; Adam Gallea; Sally Gibbs; Elle Groch; Su Grose-Hodge; Cameron Haas; Peter Hanley; Madeline Hayes; Roger Head; Hyun Hee Lee; Oliver Hopes; Adair Imri; Alexander Jackson-Wyatt; Tesha Jeffress; Caroline Karlson; Gabriel Kay; Sophie Keeling; Erin Kelly; Kaitlin (Chia-Yen) Ku; Fiona Lanigan; Anna-Sophia Larson; Ida Lawrence; Jennifer Ledingham; Caterina Leone; Marisa Leung; Jacquie Lewinski; Phoebe Lillywhite; Peter Louw; Adison Marshall; Abbey Martin; Tamara Martinez; James May; Wally McGregor; Penny McKeown; Catriona McLeod; Bridget McNab; Claudia Millot; Ben Milne; Ngoc Nguyen; Rachel O’Brien; Hannah Paine; Melissa Jane Palmer; Hilary Park; Joseph Philliponi; Bui Pilada Ponchiangdee; Alan Rhys-Jones; Rose Ricketson; Jos Roberts; Anna Robinson; Alan Rose; Tom Savell; Maurice Schlessinger; Robert Shepherd; Michelle Skelton; Missim Song; Nicholas Spiropoulos; Alex Stanuga; Leonardo Stockinger; Joey Taouk; John Tzintilakis; Patricia Varney; Skye Wagner; Zoe Walford; and Georgie Williamson. 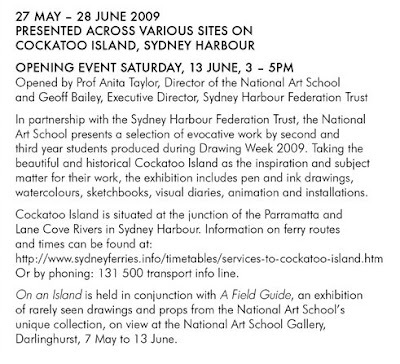 In association with the Sydney Harbour Federation Trust and Cockatoo Island, the National Art School presents an exhibition of student works produced during its annual Drawing Week. 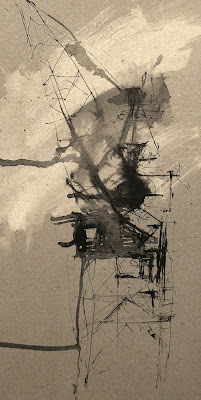 The National Art School philosophy and method is based on the idea that to draw is to engage with the act of seeing, of interpreting and transcribing the objective and subjective worlds. The activity is viewed as fundamental to all facets of artistic practice. It is this core belief, combined with a practice-oriented approach to teaching and learning, that led to Drawing Week which launches the school year. Drawing Week arose out of staff discussions about the New York Studio School’s intensive week-long ‘Drawing Marathon’, and has utilised sites such as Walsh Bay, Victoria Barracks and Middle Head over the past eleven years. The aim is to use aspects of the city and harbour as research material for drawing subjects, allowing students to hone skills and develop ideas via engagement with a distinctive environment. Guided by the experienced artists and teachers who make up the staff of the school, NAS students have spent an intensive four days on Cockatoo Island each year for the past three years - cross-legged in the shade of a towering crane, painstakingly recording the minute details of a sandstone wall or gazing out over Sydney Harbour. On an island presents the creative and inventive approaches to drawing taken by second and third year NAS students in 2009. Their work includes pen and ink on paper, watercolours, sketchbooks and visual diaries, animation, installation and a ‘sound drawing’, as well as other media that are embraced by the broad definition of drawing. Cockatoo Island is a heritage site and landmark, which has recently become a venue for regular art exhibitions and installations. A former industrial school, reformatory, shipyard and gaol, the island retains workshops, wharves and other buildings as remnants of the island’s convict and maritime industrial past. 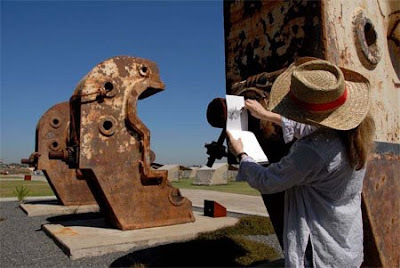 The island offers harbour views, natural landscape, architecture and machinery to inspire NAS students -and it shares a historical link with the National Art School site, which was also a convict prison in a former incarnation. This exhibition of student work coincides with an installation on the island by Ken Unsworth – A RingingGlass (Rilke). Unsworth’s work typically deals with the past, with nostalgia, loss, history, memory and the passage of time. A National Art School alumnus, his work also features in A Field Guide: From Antlers toIsland which is showing at the National Art School Gallery from 7 May to 13 June. Spanning the decades of the 1930s to the 1970s, A Field Guide features rarely seen drawings and props from the National Art School’s unique collection. Incorporating fantastic diagrams for creating puppets and other teaching guides by Frank Hinder, life-model drawings by NAS students such as James Gleeson and Ken Unsworth and studies of mythological themes and still-lifes, amongst many other subjects, this presentation peers into the often mysterious world of the drawing studio. The National Art School collection includes art acquired by gift and by purchase, works that arrived unheralded, work by teachers who are often major Australian artists, and student work, that is relatively ‘untested’ before those students join the wider artistic community. A Field Guide allows visitors to enjoy the experience of seeing art in its earliest incarnation - within the art school context - and to recognise the importance of art schools as repositories of significant and vital cultural material.